A French composer born in 1953 in Nancy. After scientific studies, Marie-Hélène Bernard began studying music at the universities of Pau, Paris VIII and Paris IV. A pupil in the electro-acoustic class of Jean Schwarz at the ENM of Gennevilliers, she completed her apprenticeship with Pascal Dusapin at the Centre Acanthes and with Bernard Cavanna at Atem. She has composed instrumental, mixed, electro-acoustic works and pedagogical pieces. She has been invited in residence at the studios of the GRM, of La Muse en Circuit, CIRM, La Grande Fabrique, MIA and Césaré. A producer for France Culture, she has also realised many radiophonic creations. Her recent research has dealt with the confrontation between western instruments and traditional Chinese instruments. She resided in China as laureate of the ‘Villa Medici fuori muri’ in 2003, and is currently preparing a thesis on Chinese composers of today. Her works includeDans les plis de la caverne (2001, premiered by Gérard Buquet), Hanshan (2002, first performed by the ensemble Fleur de Prunus for the series Alla breve on Radio France), Lu Chen (2004, first performed by the Ensemble Aleph), Gexin/cœur de pigeon for fixed sounds (2005), Lusigando (2007, premiered by Laure Morabito and Pierre-Albert Escoffier), Les Ailes du phénix (2009). Marie-Hélène Bernard was born in 1953 à Nancy. She undertook scientific studies (master’s degree in mathematics), then turned late to musical studies at the universities of Pau, Paris VIII and Paris IV. Jean Schwarz taught her electro-acoustic music at the École Nationale de Musique in Gennevilliers and Serge Ortéga composition at the École Nationale de Musique in Pantin. She was also the pupil of Christian Accaoui for harmony and counterpoint and analysis. 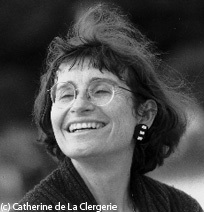 She furthered her knowledge with Pascal Dusapin when following a course at the Centre Acanthes, and then with Bernard Cavanna at Atem. Marie-Hélène Bernard is attracted by the Orient. In 2000 she defended at the Université de Paris VIII a master’s memoir in musicology on The influence of Asiatic cultures on western composers of the second half of the twentieth century. She continued her work at the Sorbonne and in 2002 presented a memoir for a DEA in music and musicology of the twentieth century, under the direction of Jean-Yves Bosseur entitled The Emergence of a generation of composers in Continental China after the Cultural Revolution. In 2003 she was a laureate of the ‘Villa Medici fuori muri’ and by virtue of this resided in China. She recorded the sounds of Peking, absorbed oriental traditions and deepened her knowledge of traditional instruments. In that same year she also became scientific adviser for the exhibition ‘Alors la Chine?’ at the Centre Pompidou. Marie-Hélène Bernard is currently preparing, as part of her ongoing research work, a thesis on the Chinese composers of today. Marie-Hélène Bernard has produced many radiophonic documentaries with France Culture for the ‘Atelier de création radiophonique’, ‘Surpris par la nuit’ and ‘Chemins de la musique’, and with Arte-Radio. She obtained a support bursary for radiophonic creation from the SCAM (Société Civile des Auteurs Multimédia) in 1992 and again in 2003. She has also created aural environments for exhibitions such as Le Train du génome or others in collaboration with photographers (Y. Lambert, Jane Atwood). Marie-Hélène Bernard is currently teaching at the CFMI in Lille and shares her time between her activity as a composer and sound artiste, teaching and her university research. She has also in recent years found an interest in writing for children, as in C’est l’heure for instrumental ensemble and two primary level classes for the ‘Chantiers de la création’ of the Orchestre National de Lyon. Her compositions are the reflection of her itinerary and her aspirations. She has written instrumental works: Kirkük for three oboes and bass clarinet (1991); Mallku for instrumental ensemble, first performed by the Ensemble Musique Oblique in 1992; Lusigando for oboe and harpsichord (2007), first performed at the ‘contemporary meetings’ of Saint-Privat d’Allier. Mixed works are also well represented in her production: Corail de nuit for horn and tape (1989); Dans les plis de la caverne for tuba with real time treatment and fixed sounds, premiered in 2001 by Gérard Buquet in the ‘Multiphonies’ cycle of Radio France; Les Ailes du phénix for sheng mouth organ and live electronics (2009); Sul Pontile for quartet and electronics (2010). Her works for tape reveal her taste for the recording of aural landscapes and their transformation: L'étoile bédouine (2000); Mousson (2002) and for multi-diffusion: Gexin/cœur de pigeon (2005). Marie-Hélène Bernard has in addition composed radiophonic works: Au jardin des délices (1993); Il ne faut pas désespérer des neak ta (1995); Barbès-Stalingrad: ya rayi! (2000); Au jardin des tarots (2002), Le divan de Monsieur Huo (2005). Marie-Hélène Bernard calls on the literary arts, notably poetry. Hirondelles for reciter and electro-acoustics (2008) is based on Essere rondire, a poem by the Italian Mario Luzi, and Tchernoziom for two voices, bass clarinet and fixed sounds (2007) on poems by Ma Desheng. She has previously written works on poems of Jacques Roubaud (Avalon, 1994; Les Animaux de tout le monde, 1995), as well as on texts of Michel Butor (Angkor, 1995) and of Homer (Kyklopia, 1999). Her very strong attraction for Asia can be found in both her evocative titles (Des journées entières sur le Mékong, 1997; Palanche for cymbalum, 1997) and in the subtle blend and the confrontation she sets up between western instruments and traditional Chinese instruments: Lushan for erhu, bassoon and harpsichord (2000); En gravissant le mont Lu for erhu, viola da gamba and harpsichord (2001); Lu Chen for guqin zither, female voice and instrumental ensemble (2004), first performed by Dai Xiaolian and the Ensemble Aleph at the Théâtre Dunois in Paris. The multimedia concert Une seconde est un monde (2009) presents, between East and West, a poetic, musical, pictorial and aural treasure hunt in the heart of the world of Ma Desheng, a Chinese painter, calligrapher and poet living in Paris. This work forms a synthesis of her art, passages of relay, friction, glissando, interweaving: from speech to song, from French to Mandarin; from sounds of the clarinet, of the accordion, of percussion to those of the zither, the mouth organ and the two-string hurdy-gurdy. Une seconde est un monde in this way brings together creative artistes from the West (Marie-Hélène Bernard and the Ensemble Aleph) and the East (Ma Desheng and the musicians of the Shanghai Conservatory) in an artistic fresco that achieves totality.